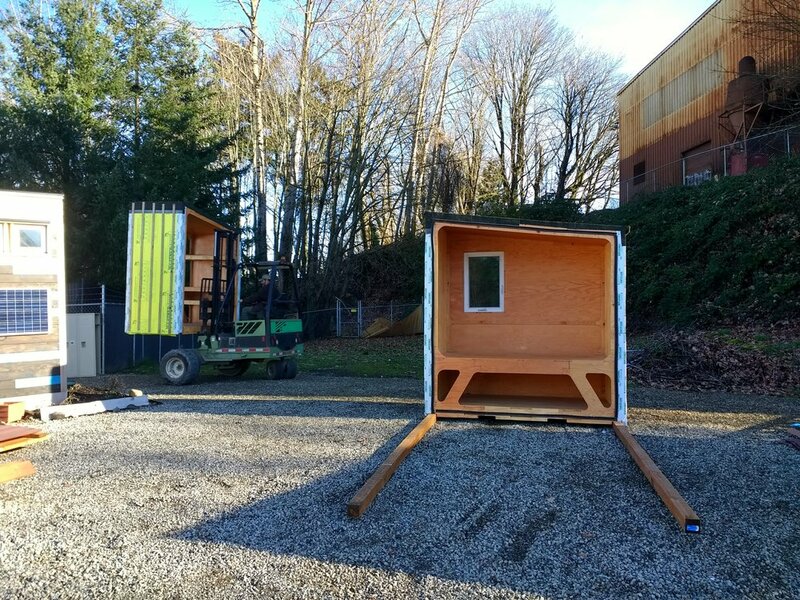 In the Summer & Fall of 2017, we partnered with SERA Architects, Portland State University's Center for Public Interest Design (PSU CPID) and the Portland Art Museum (PAM) to design and construct a majority-CNCed tiny home, which was the PlyPAD (Plywood Portable Attachable Dwelling). This page serves as a resource guide for anyone interested in learning more about our work on the PlyPAD. It's no secret that the city of Portland has a houselessness issue. Many people live on the streets of Portland year round. 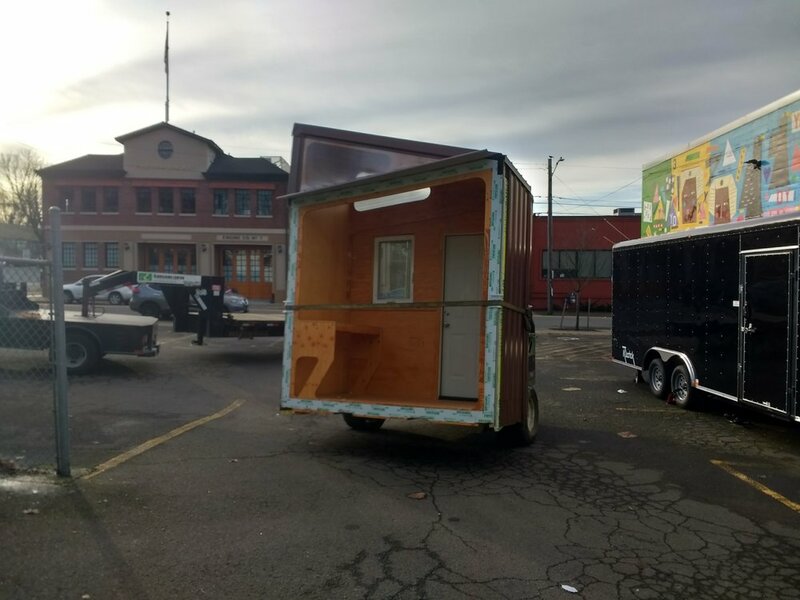 In late 2016 & early 2017, the PSU CPID created the POD (Partners on Dwelling) Initiative, asking architecture firms throughout the city to submit designs and construct tiny homes that would eventually be placed in a village in North Portland, housing numerous previously houseless women. 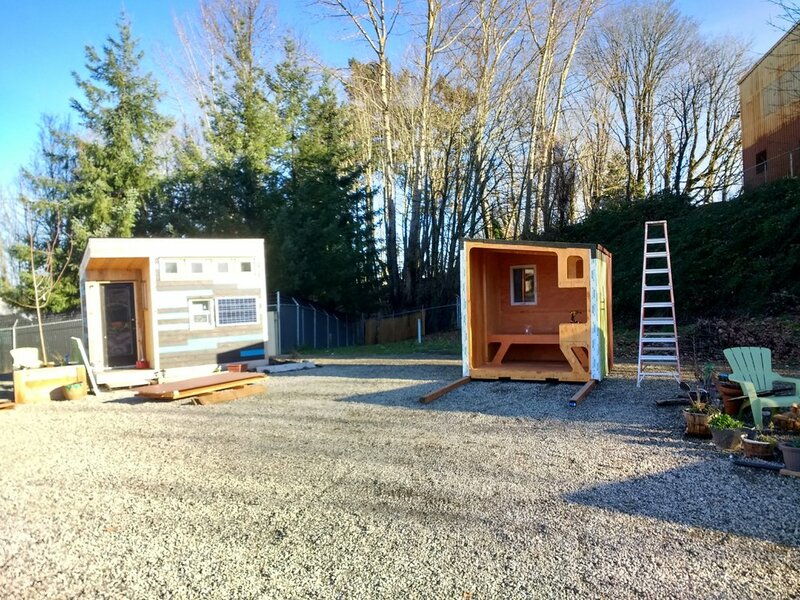 Many fantastic designs were created and constructed using mainly traditional building techniques, and these tiny homes now make up the Kenton Women's Village in Portland. 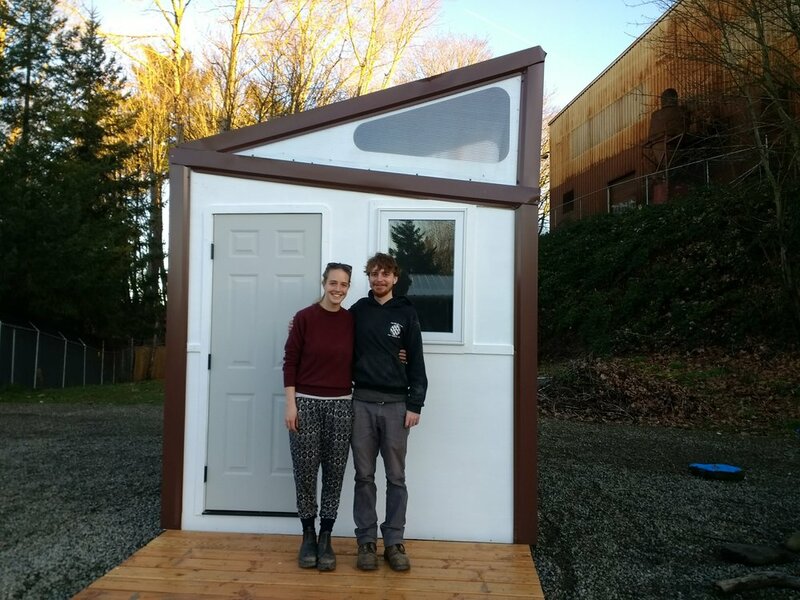 When we (Bar and Hannah) moved Maslow to Portland in early 2017, we immediately made an effort to become involved in the efforts to construct homes for houseless individuals. These type of humanitarian goals were and continue to be a huge part of the inspiration for the creation of Maslow. The first round of homes constructed through the POD Initiative had just been completed, so we expressed interest in helping to construct another home in the future if any further initiatives were started. 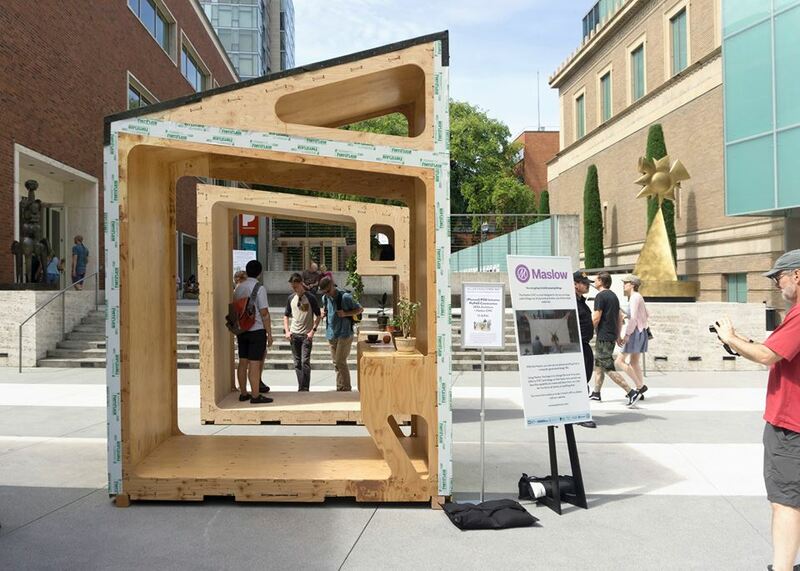 In Spring of 2017, it was revealed that there would be an exhibit at PAM showcasing architect John Yeon, one of the pioneers in the use of plywood in large-scale construction, particularly in the Pacific Northwest. In conjunction with this exhibit, we were asked to select a majority-CNCed design out of 12 that were submitted by Portland architecture firms, and in turn build this design to add to the homes in the Kenton Women's Village. In June of 2017, we met with members from the PSU CPID as well as the PAM to select the winning design, which was submitted by SERA Architects. Over the course of many hours between July and October of 2017, we worked with SERA to build their PlyPAD. 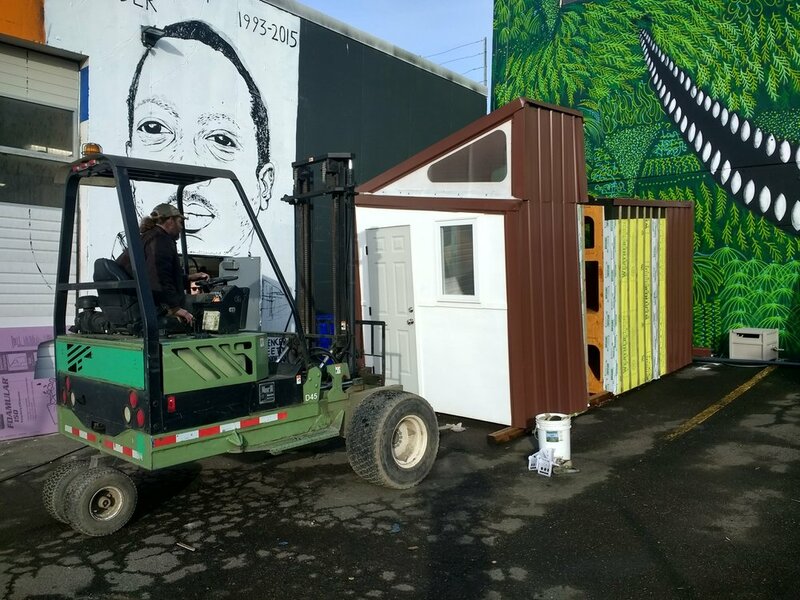 With the tiny home now finally about to be moved to the Kenton Women's Village, we're happy to tell our story and say that we were apart of this amazing initiative. 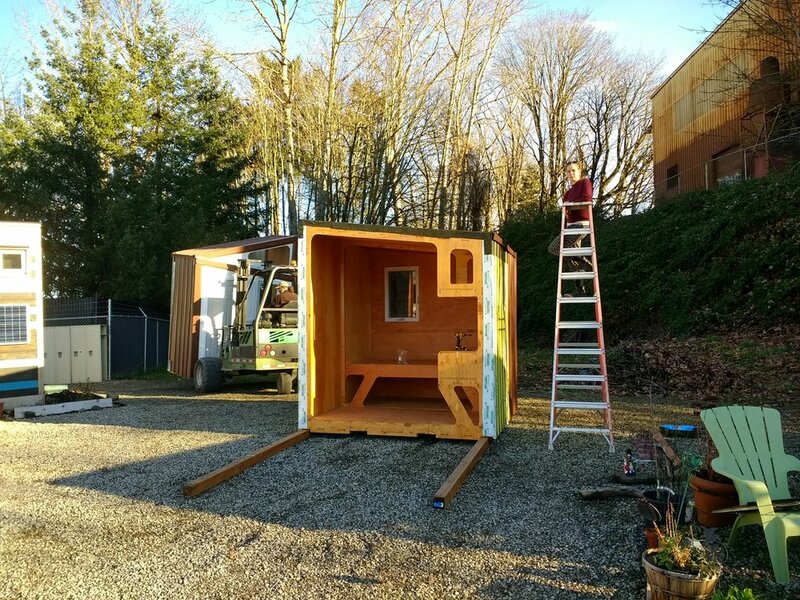 Designing and building a CNCed tiny house is no easy task, though, so we want to share our photos, story, and lessons learned so that hopefully those working to build CNCed tiny houses in the future can have an easier time than we did. We believe sharing the knowledge we gained from this endeavor is paramount in moving toward making CNC technology more accessible to everyone. Below is the collection of photos we took while working on the PlyPad. The design of the PlyPAD was constrained by the needs of The City of Portland. 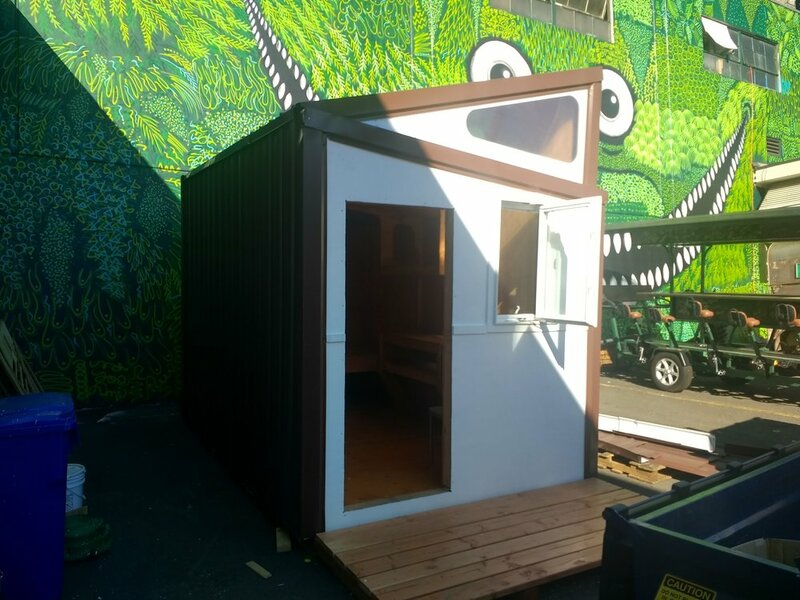 We were allowed a maximum interior space of 8'x12' with an option to add a porch. The design needed to be portable so that if the city needed to move it, they would be able to do so, and because it was necessary to move the PlyPAD from where we built it to the Women's Village. The initial design from SERA met these challenges in a unique way. The structure was divided into four three foot sections, each of which could be lifted with a forklift, could be transported independently, and could be bolted together at the final site. The roofline was designed to be a saw tooth pattern so that each module would have a clerestory to let in natural light. The ribs where the sections met would become an integral part of the design. Each rib could be brought inwards to form supports for built-in CNC furniture. Once the design was selected by CPID, The Portland Art Museum, and Maslow, we began the task of actually building the structure. Several changes were made immediately. First it was decided that the 3' modules didn't make sense when plywood comes in 4' sheets. Using 4' modules would mean that each sheet of plywood could be used more efficiently, and so it was decided that the modules would be extended to 4'. The bed was rotated to be along the back wall to make better use of the space. No plan to effectively waterproof a saw tooth roof which could come apart and go back together could be come up with, so a compromise was reached where there would be two clerestory instead of four. Each module is constructed from CNCed plywood ribs which support tabbed plywood panels constructed by applying a template to the edges. The walls are formed by bonding the inner and outer tabbed panels to sheets of Polyiso rigid foam insulation to form a structural insulated panel (SIP) which works exceptionally well to provide a rigid structure. Two by fours were used wherever two pieces of plywood joined at a 90 degree angle to provide more material to screw into. One module under construction showing the makeup of the wall structure. The PlyPAD was a very experimental project with the aim to explore new techniques. Some of those new techniques were tremendously successful while others needed refinement. Here's what worked and what didn't. The 4 foot modules were very successful. They resulted in minimal wood waste, the ribs divide the space nicely, and each module is strong. Transporting them with the forklift works well. Using rigid insulation to give the walls structure provided a very sturdy structure. The plywood is strong under compression or tension, but susceptible to bending. 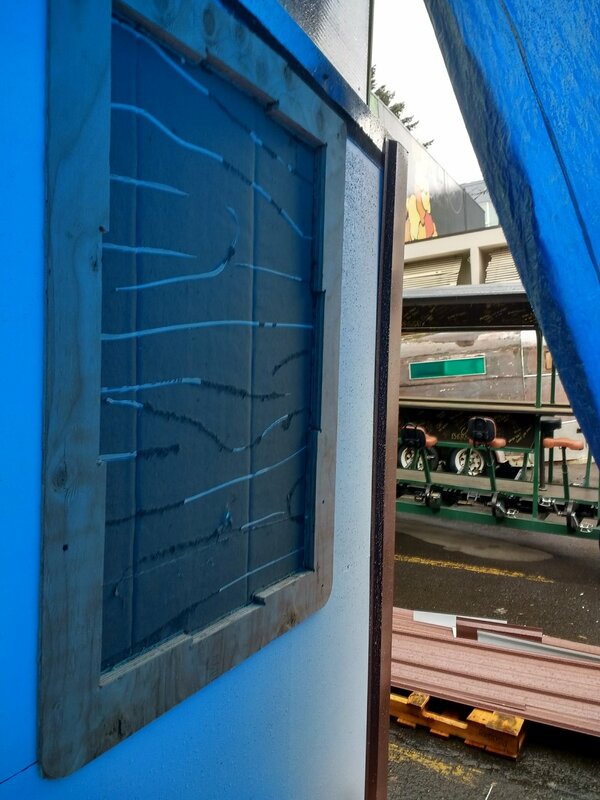 The rigid foam core of the walls forms the plywood into a box beam which is very strong. In the future we would like to take this step even further by building the module then filling the walls with spray-in insulation foam. The CNC-made built-in furniture was one of the aspects of the design that really set the SERA design apart. The space is not large enough for traditional furniture to make sense, and building it into the walls is aesthetically pleasing and makes the space more livable. The use of CNC cut templates worked tremendously well. The templates let us add tabs to the edges of the plywood sheets which would have been difficult to do with a CNC machine. They also let us work with our hands while the machine was cutting out the other parts which was very efficient. Using 2x4s at the joints where the plywood sections met was a big hassle. Because the plywood sheets were not attached directly to one another it was sometimes difficult to get them to match up perfectly. We were able to work around this by using long bar clamps to pull the parts together, but in the future we would remove the 2x4s and replace them with captive T nuts which would allow the panels to be directly connected. Demonstrating how T nuts can be used to join two panels at a right angle. Note that it is possible for the nuts to be in both parts, not just one side as shown. 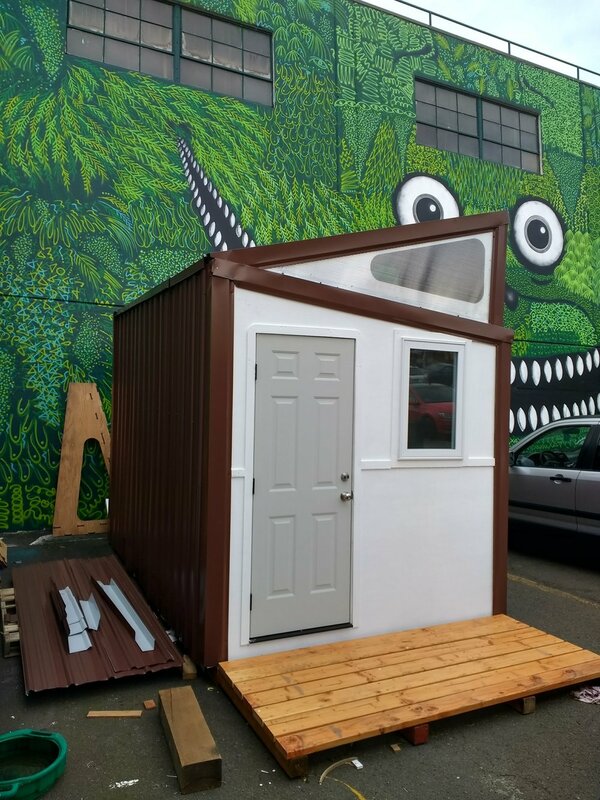 The metal roofing of the POD is one aspect of which we am not particularly proud. The originally specified roofing metal turned out to be way out of our budget. We have mixed feelings about the clerestory. The clerestory module is too tall to be transported on the back of a regular truck without hitting power lines, and is almost entirely uninsulated while the rest of the pod is insulated to R28. Because of these two concerns the second clerestory was removed from the design part way through. That being said, the clerestory does bring in beautiful light and makes the space feel like less a cave which is important. It is a powerful design element which needs to be revisited from an engineering perspective. Have a complete model of ALL parts before constructing anything. The project was too experimental for us to have a complete model from the outset but it would have made a huge difference. A lot of time was spent setting up and cutting one off parts, whereas if we had a complete design we could have spent one day setting up all our gcode files, and then run them all as full sheets which is much more time efficient. On a similar note, buying all of the materials in a single trip would have been a huge time saver. We ended up making a trip to the building supply store almost every day which consumed a lot of time. Having a complete list of parts and ordering them to be delivered all at once would have let us take advantage of bulk discounts and saved time. As a very small business, one of the ways that we justified considerable time and money invested in the PlyPAD project was as a way to test Maslow's capabilities, and improve the design. In this capacity, the project was a huge success. The PlyPAD was a tough project for Maslow. It has a very large number of parts, all of which need to fit together precisely. One of the big struggles with Maslow has been calibrating the machine so that the cut parts come out precisely to the desired size. A 12' tall box joint like the ones which make up the edges of the PlyPAD are very susceptible to any inaccuracy in the parts. 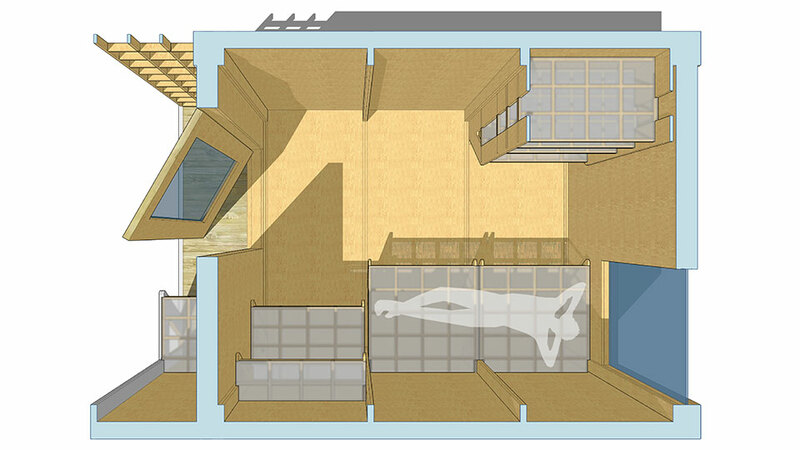 This was something we struggled with in the initial parts of the building process. We improved the calibration routine, but that still wasn't enough. Ultimately, we made what we think is a big step forward for the project and switched from a quadrilateral kinematics system where the chains anchor to two separate points on the sled to a triangular kinematics system where the chains virtually meet at a single point. Our new ring system, where chains point to a single spot - the router bit. The PlyPAD is open source so others can build off of our designs. Here are the CAD files for each module. Each module CAD file contains a "Parts To Cut" tab which will give you ready to cut blueprints for each part. Reliability and cost of CNC routers. Ultra low cost machines like Maslow are still in their infancy, while most other machines are cost prohibitive. Lack of knowledge base. 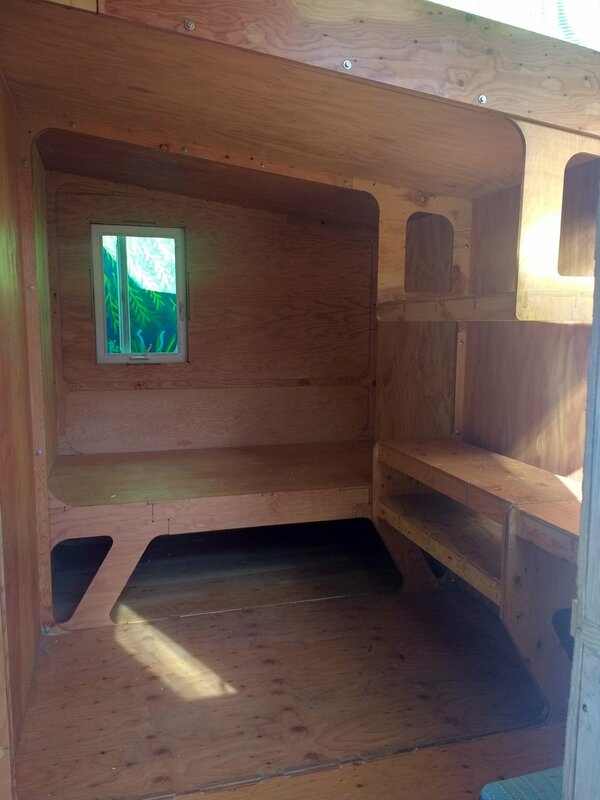 There are many resources available online to cover traditional construction techniques, but few for CNC based housing. Lack of existing projects to build off. One of the major strengths of designing digitally is that projects can be shared around the world and each design does not need to be done from scratch. Until there is a base of existing designs out there, this is not the case. CAD limitations. Most CAD packages are either designed to model small objects with tremendous detail for manufacture (AutoCAD, OnShape, SolidWorks...etc) or they are designed to model large objects, but without enough detail to manufacture (Revit). 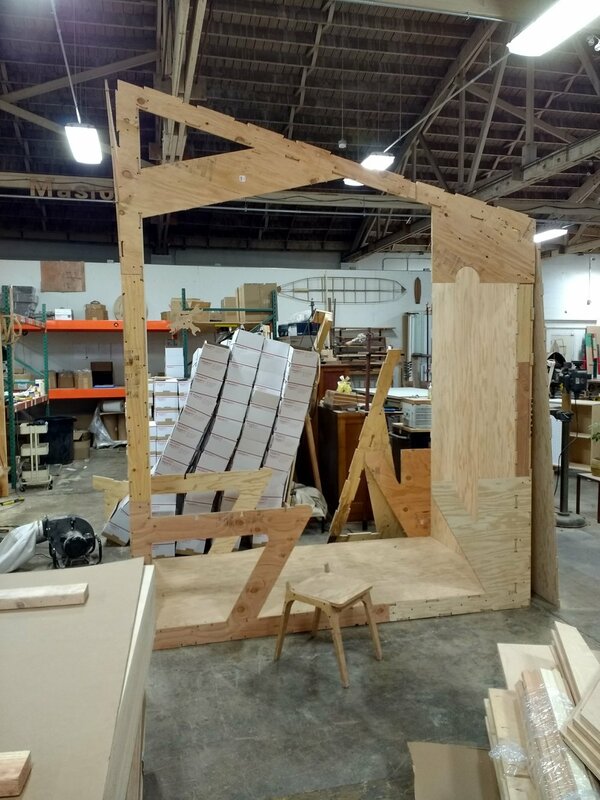 Despite those limiting factors, and the fact that we would not currently recommended a CNC cut plywood structure as the cheapest or easiest way to build a house, we believe that this idea will become very viable in the next few years. Maslow and other projects are currently pushing the boundaries on making large scale digital fabrication technology available to many more people. As more people have access to the technology, the community knowledge base needed to make this type of construction will grow, allowing for exponential improvements. There are tremendous and exciting advantages to building this way. Unlike nearly every other object in the built world, houses are still constructed as one off projects. The way we build has not changed dramatically in the last 100 years. If we change that and allow larger teams to work on designs digitally we believe we can put more thought into every detail, making structures which are cheaper and easier to build, more enjoyable to live in, and more efficient. We're excited to see what the next decade of building looks like, and we hope Maslow has a positive role to play there.